A month ago, my 7-year-old son Austin brought home a book he made at school called the “ABC” book. For each letter of the alphabet, he had chosen a word that started with that letter and written a sentence or two. (“A is for apples. I like to eat apples.”) I didn’t look through it for a while, but I picked it up the other day and on the last page I found this tribute to his friend Zander. I don’t really know Zander, or his parents. But I was truly touched by what my son wrote about him. 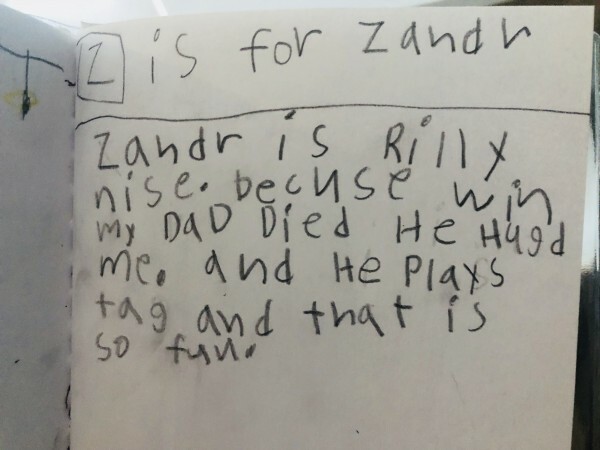 Of all of the things he could have written about his friend, Austin remembered how when his dad died in January, Zander gave him a hug. Maybe Zander’s parents told him what to do, or maybe the counselor who spoke to the class suggested it. Maybe he just felt like hugging Austin when he saw him. I don’t know. But what I do know is that a little boy knew that his friend was hurting and he didn’t ignore that pain. He gave him a hug that my son remembered 5 months later when he wrote these words. Of all of the things that we are teaching our boys, I think this is the most important: Reach out when your friends are hurting. Hug them. And then go play tag with them.